While the names of Rick Griffin, Victor Moscoso, Mouse Kelley, and Hapshash and the Coloured Coat remain far less familiar than the likes of the Grateful Dead, Jimi Hendrix, Frank Zappa, and Janis Joplin, it’s doubtful that the latter crowd would have made their countercultural impact without the former as smart creators. Their inventive poster art, originating with the Beats, blossomed with lysergic and other chemical enhancements energizing both performer and designers by the mid-1960s. Many at that time might have been too distracted by their stimulants to pay attention to the ephemera of the stars. Therefore, many examples became rare, once the galleries caught on to the nostalgic and enduring appeal of the era. Peter Golding, who created the first “designer jean,” manned London’s ACE boutique in trendy Chelsea. He was not only an early scenester, but a savvy collector. His “Inspirational Times” exhibited the work; his archive presents over 30 portfolios by the best artists of the generation that came of age with rock ‘n’ roll. From 1955 to 1988, Elvis to the Yardbirds, Led Zeppelin to the Velvet Underground, Golding’s collection chronicles the best moments of much modern music. Having lent many pieces to shows at the Tate Liverpool and the Victoria & Albert Museums, Golding allows readers to gaze at these works in the reduced but still enjoyable medium of print. Not to mention 738 bold, vibrant, or odd illustrations. Aided by the alternative press pioneer Barry Miles, this handsomely compiled combination of informative text and swirling, lavish, stark, and unsettling designs appeal to the eye and the mind. The mind especially will be intrigued. 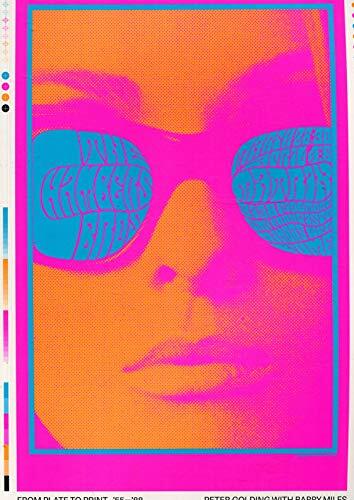 For as the writers note astutely in their commentary on the first psychedelic poster connected to the nascent San Francisco hippie culture, The Charlatans’ 1965 small contribution features many of the characteristic traits of a style that would sweep The City—first in the Bay Area and then that in London—and more than one hip urban district named Chelsea. The hand-drawn poster known as “The Seed” contained “virtually all the elements that characterize San Franciscan psychedelic art: cartoony drawings, blobby lettering, decorative borders, dingbats, and other references to old-time Western advertising.” Elegant as it is, it lacked one crucial improvement. Color. When that arrived with silkscreen, separations of tones, paste-ups, and printing plates to allow artists to craft their works carefully, the results stunned viewers. What had been clear advertisements for shows became intricately lettered Art Deco-ornamented swirls of fonts, clip art, and illustration. Taking apart the mechanisms by which the posters were assembled from these technologies and media, the reader can appreciate the layers of hue and image which underlay the finished product. These are sampled as marginal content while accompanying text—strangely in relentless capitals—narrates the artists’ own recollections and explanations. A careful scrutiny of the informative main text, in more typical form, instructs the student of these three decades about crucial contrasts as the rock art found an international reception and eager imitation. A famous example is the “Maximum R&B” black and white image by Brian Pike featuring Pete Townshend of The Who. Still, it took the underground concerts at the UFO Club to introduce the Alphonse Mucha-inspired sinuosity and the haunting figures from Aubrey Beardsley and Arthur Rackham to provide an English tone for London’s posters. It must be admitted that the best selections emanate from the later 1960s. Detroit, Paris, New York City, and Los Angeles joined the rush to commemorate acts in vivid shades and disorienting patterns. But the freshness of the London and the Bay Area originators of the styles displayed in Rock Graphic Originals endure as the best examples of a cultural efflorescence accompanying the tunes. Rock Graphic Originals will enrich the mind and entice the eyes of any aficionado of a time when rock mattered. One diligent fan saved these posters from the bin.